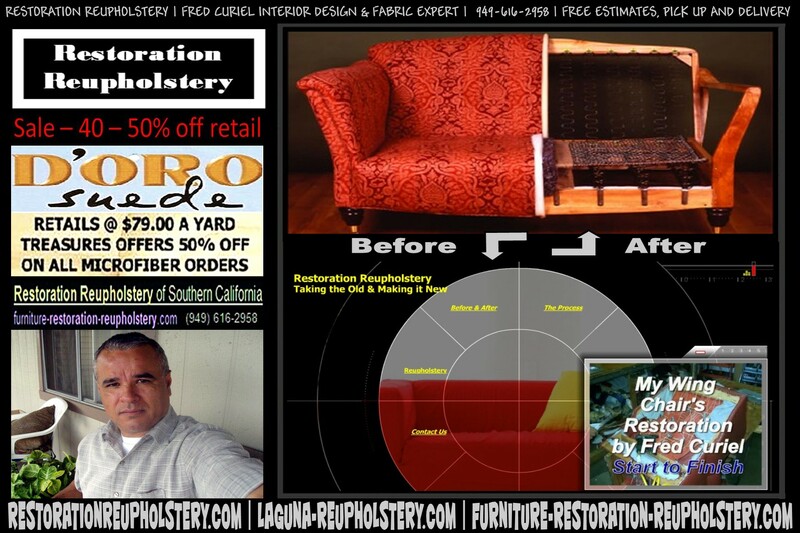 Los Angeles, Orange County, Ventura, San Diego, Riverside, RANCHO SANTA MARGARITA, SADDLEBACK VALLEY, SAN CLEMENTE, TUSTIN, YORBA LINDA | RestorationReupholstery.com | 949-616-2958 - Fred Curiel | Send your emails with pictures and questions to Fred@RestorationReupholstery.com | Again, we thank you for the business!!! Restoration Reupholstery buys factory direct, which guarantees you the chance to see all options and styles with free no nonsense quotes (Email us a picture and the story fabric wish, rebuild, repair, restuff, etc) at amazing prices. Buy new & then call to see our mobile show room bring out the fabric and foam options to help make the decisions within your budget. Fred and Ivankas Restoration projects often end up better than when you bought it Change the fabric to the color, foam, lengthen or customize into the piece you wanted it to be! Fred Curiels 33 plus years of experience in all aspects of the furniture business give him the ability to offer impeccable workmanship, hand crafted perfection, outstanding customer service with prices that match the best deals available in Southern California.